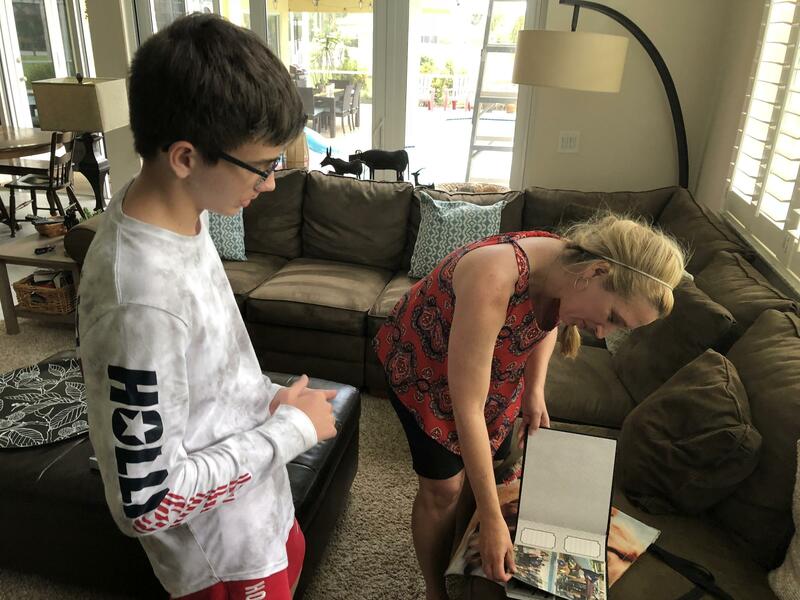 Marjory Stoneman Douglas High School sophomore William Olson and his mom, Lisa, flip through an album of photos showing the 15-year-old with therapy dogs at school after the shooting. The album was a gift from Debbie Beaudin, whose golden retriever Sammy developed a special bond with William. 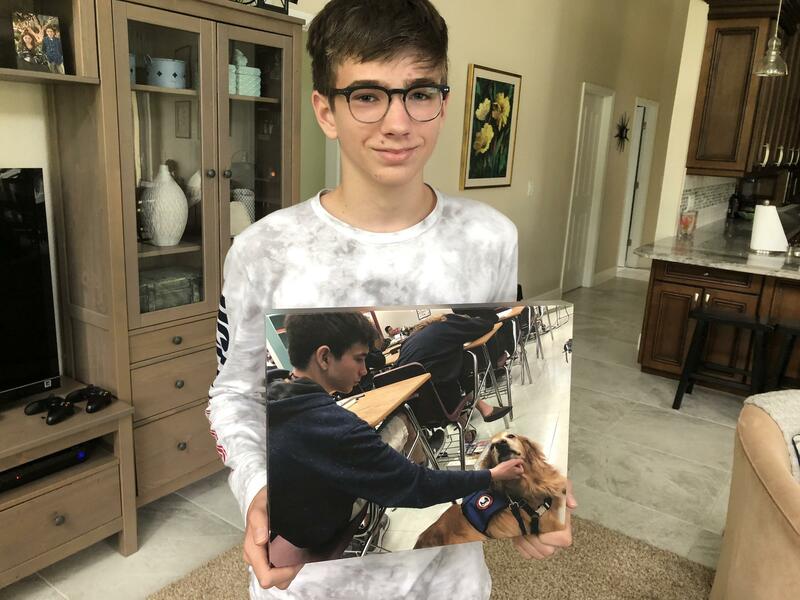 Marjory Stoneman Douglas High School sophomore William Olson shows off a photo of him petting therapy dog Sammy during class. He is a quiet kid, but he lights up when he talks about the dogs he spent time with after the shooting. 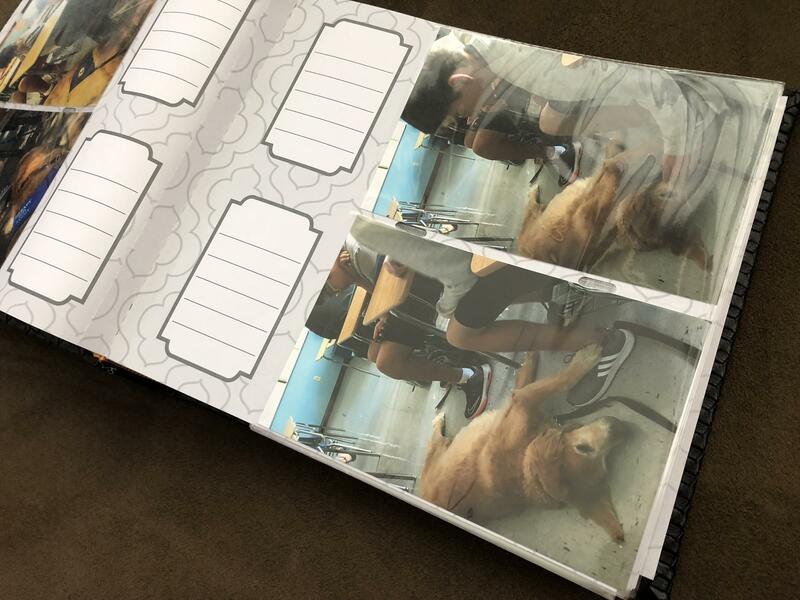 William Olson has baseball-like cards for the therapy dogs he has spent time with since the Feb. 14 shooting. An owner of one of the dogs gave him an album full of photos, too. William Olson on the day he received his donated therapy dog, Skipper. Skipper is a cross between a Bernese Mountain Dog and a poodle. 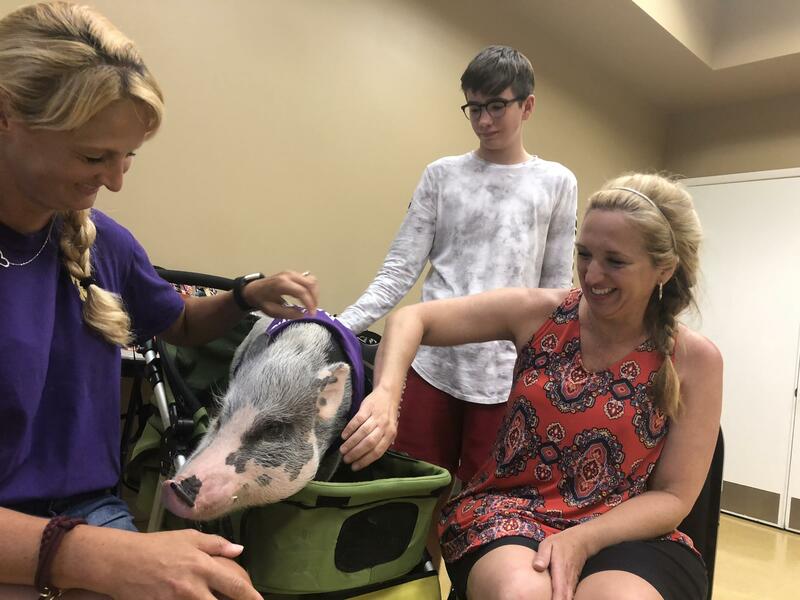 William Olson and his mom, Lisa, right, visit with Patches, a therapy teacup pig who rides in a dog stroller "because he walks really slow." That's according to Patches' owner, Tiffany Aaron, left. 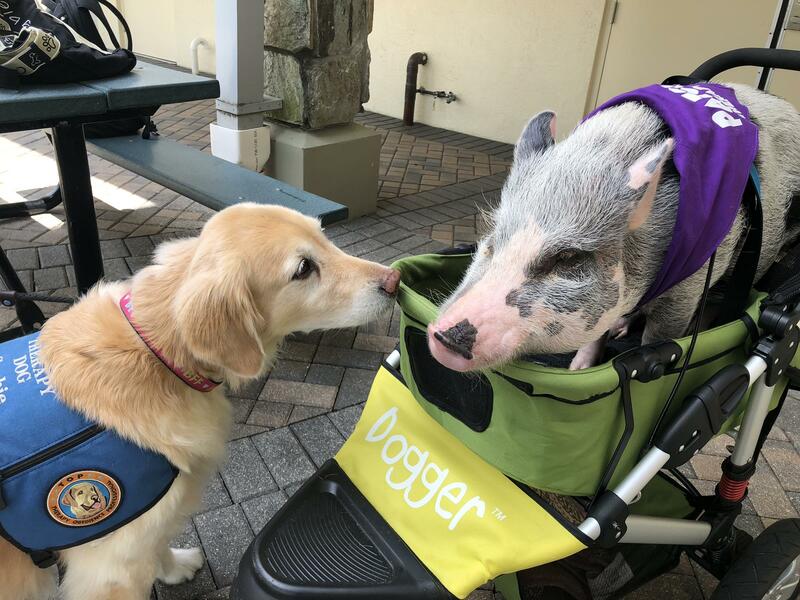 They're at the Parkland rec center during a Therapy Dog Thursday event over the summer. 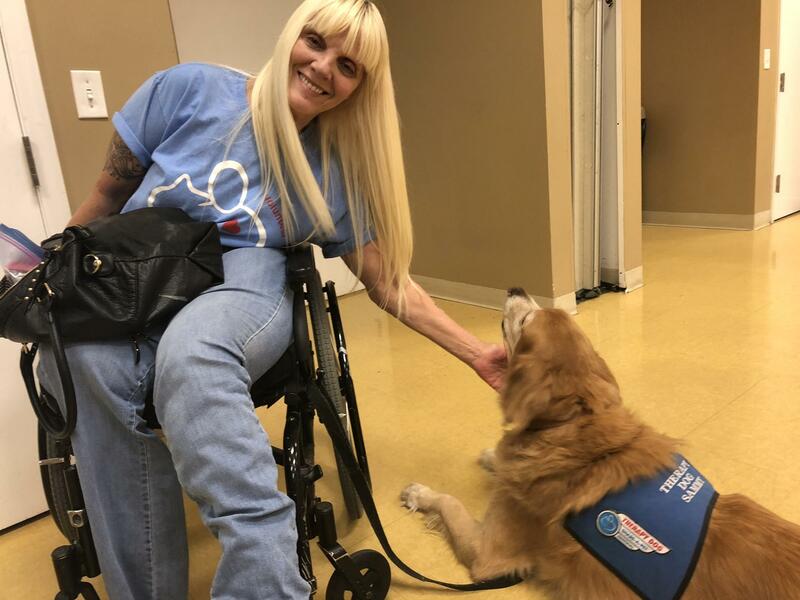 Debbie Beaudin poses with her therapy dog, Sammy, at a Therapy Dog Thursday event in Parkland. 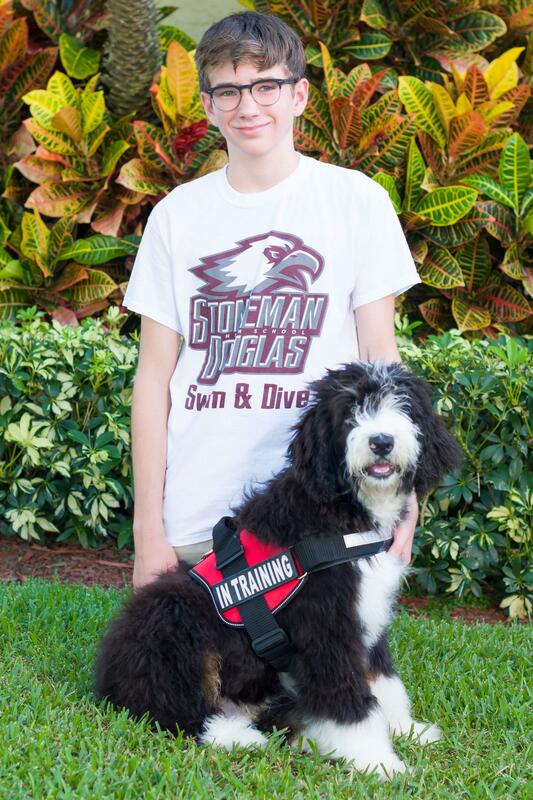 Beaudin is paralyzed and first got Sammy as a service dog for herself. 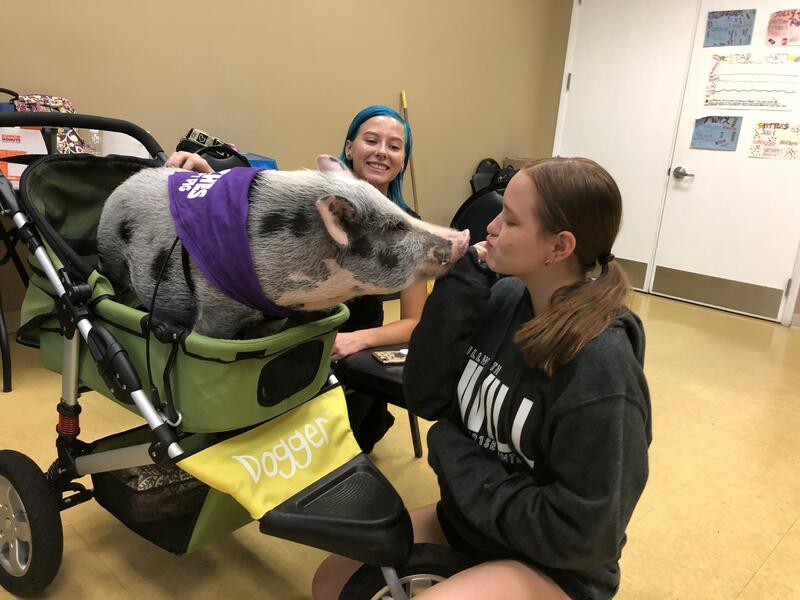 Reagan Licata, a 14-year-old new freshman at Douglas, puckers up to kiss Patches, a therapy pig she has declared her boyfriend. 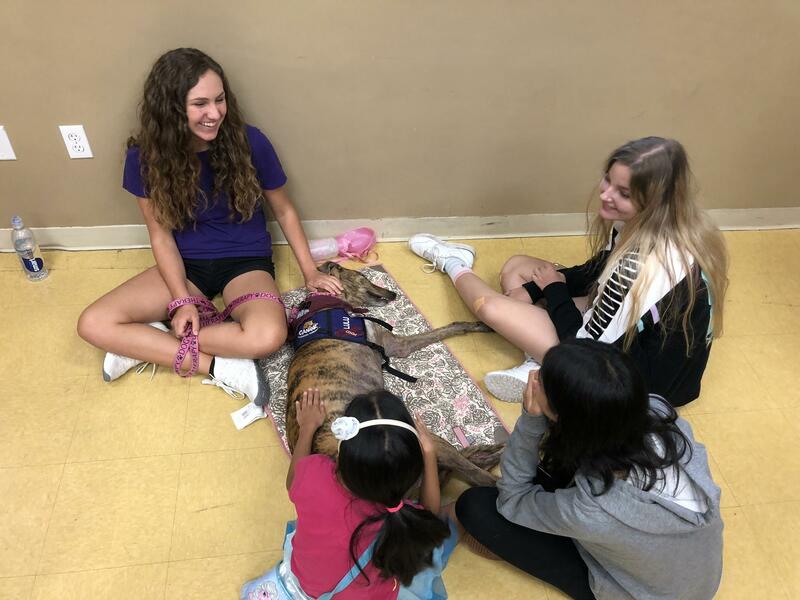 Emily Aaron, 15, sits up against the wall at a Therapy Dog Thursday event with her three-legged greyhound, Lulu. Siblings Alexa and Kiran Goel pet Lulu, saying they couldn't choose a favorite therapy dog but she is definitely one of the best. Above, Sophie greets Patches. 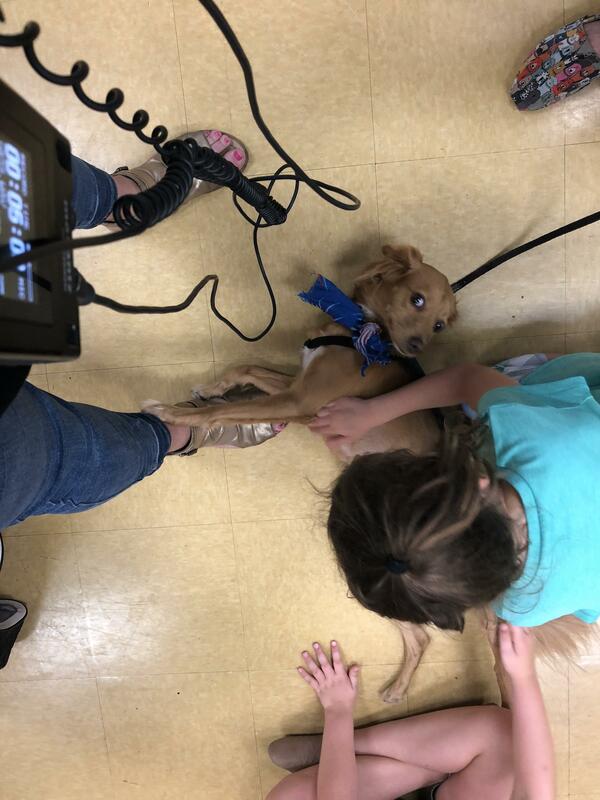 Below, therapy dog Emma, a rescue from Puerto Rico, lays on the feet of WLRN reporter Jessica Bakeman during a Therapy Dog Thursday event in Parkland over the summer. 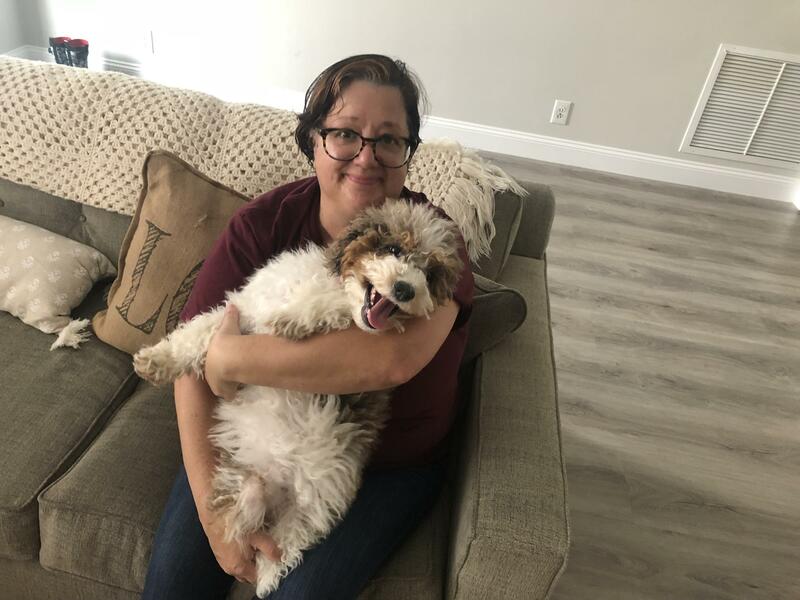 Marjory Stoneman Douglas High School library media specialist Diana Haneski holds her new puppy, River, at her home in Margate. 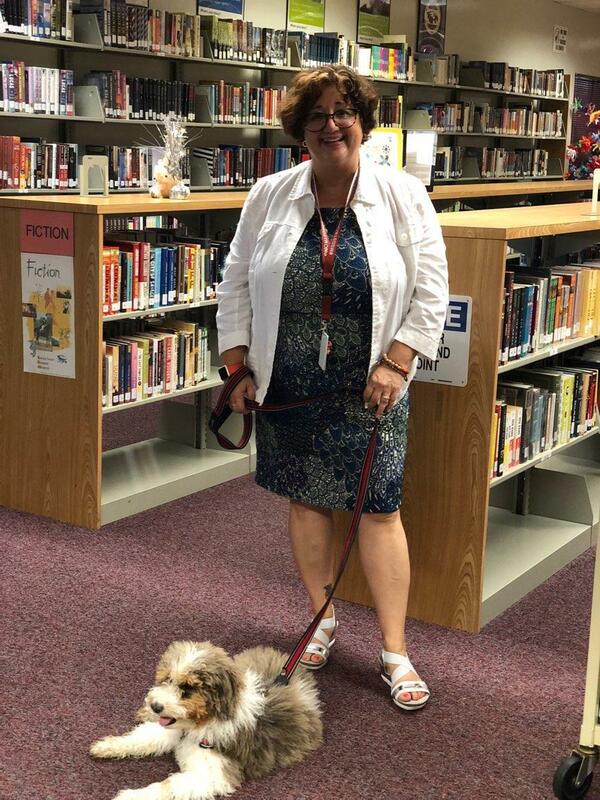 River is in training to be a therapy dog and is going to school with Haneski every day. Above, Diana Haneski with River in the Douglas library. 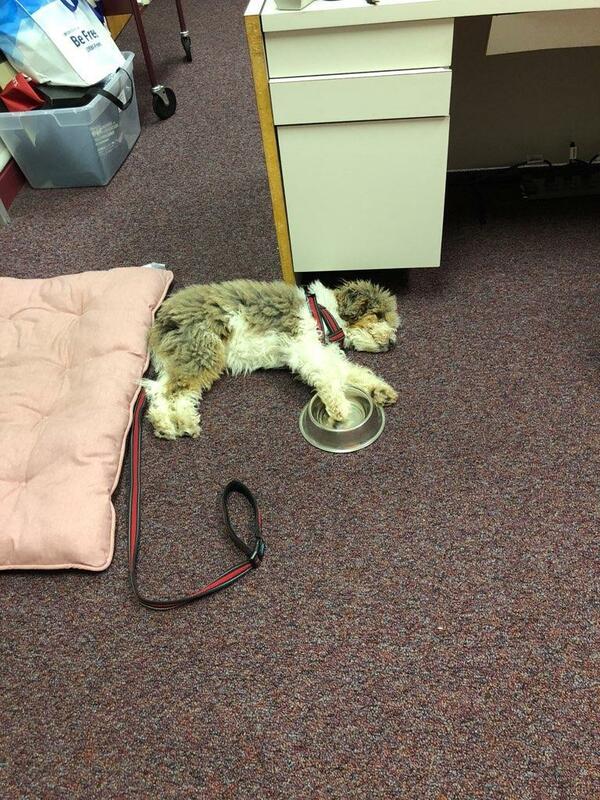 Below, River with her paw in her water bowl at her new job as a therapy dog in the library. 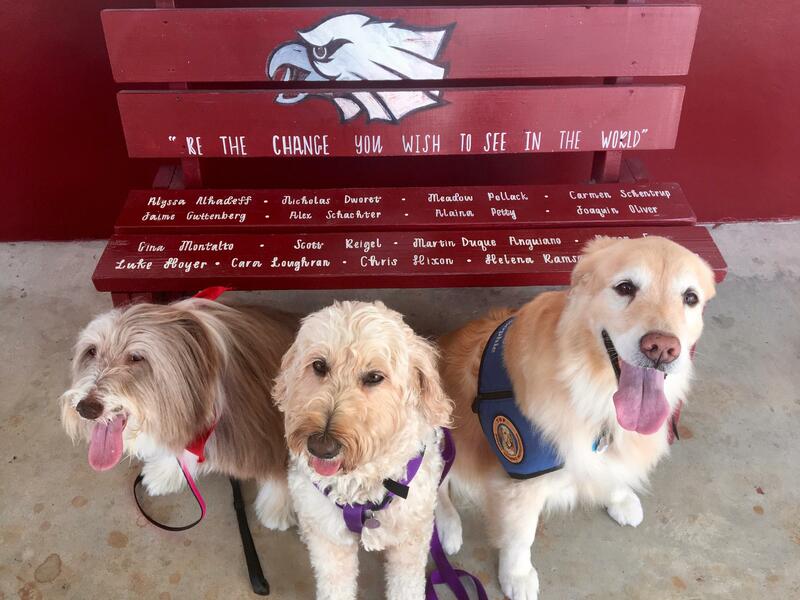 From left, therapy dogs Daisy, Fergie and Sophie pose in front of a memorial bench near the main office at Marjory Stoneman Douglas High School.